The landmark Philips lighting building in Eindhoven houses an unexpected secret – deep within its structure is a futuristic laboratory where light is tested for its power to encourage plant growth. 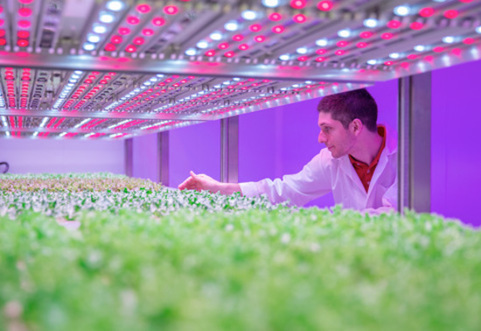 Opened in August 2015, the GrowWise City Farming research centre is a state-of-the-art facility with one goal – providing LED lighting solutions for producers who need to grow quality food indoors all year round. But just what can they achieve? According to Gus van der Feltz, Philips global director of city farming, the research enables “local food production on a global scale, reducing waste, limiting food miles and using practically no land or water”. The claims are based on the unique cost efficiencies and control that LED lighting offers the new generation of “vertical” farms (i.e. those using racks in limited spaces). Not only does growing in a controlled environment reduce food miles and loss due to pests and disease, producers can even use diodes of different colours to manipulate plant height, width, colour and taste. In an age of growing concern over feeding our burgeoning world population, GrowWise are laying the foundation blocks of a very different way of farming vegetables for future generations. LED lighting solutions create a recipe for optimum plant growth.